RealiTone are building a catalogue of interesting, if somewhat eclectic, Kontakt-based virtual instruments. OK, so a library such as RealiDrums is not so left-field, but RealiBanjo and RealiWhistle are perhaps more obviously niche products while RealiVox Ladies and RealiVox Blue — vocal sample libraries that can conjure some fabulous female vocal parts — are actually pretty ambitious products. 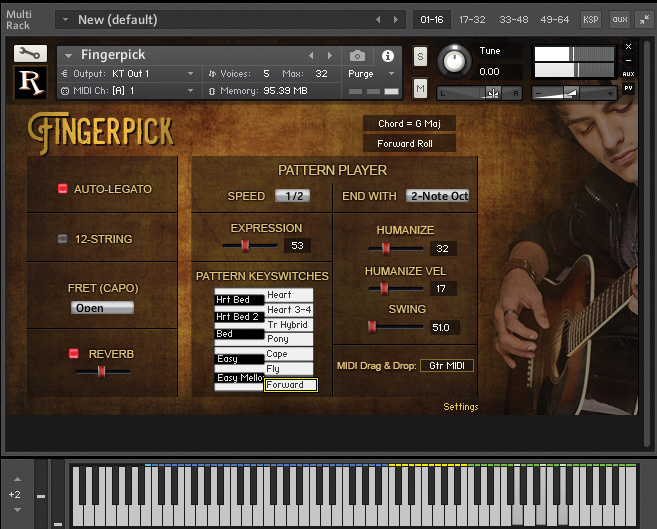 The latest addition to the collection is RealiTone Fingerpick and, as the title suggests, this provides the user with a fingerpicked acoustic guitar within a compact Kontakt-based virtual instrument. We are not, of course, short of sample-based virtual guitar instruments. However, Fingerpick might appeal to some users on two specific grounds. First, it is very focused. You get a single sample-based acoustic guitar (plus a simulated 12-string option) and, while it can be played manually, the neat Kontakt front-end offers a selection of keyswitch-triggered fingerstyle patterns; playing realistic fingerstyle guitar is really very easy. Second, the focussed approach also means a relatively modest price point, great for those on a tighter budget, particularly as, at the time of writing at least, you can pick it up at a discounted $79.95 price. Operation couldn’t be much easier. The instrument maps across the Kontakt key range in a number of zones with the dark blue zone being ‘playable’ freehand. However, the real fun is in combining the green zone, where you can play a huge range of chord types that the engine will recognise, and the yellow zone that will trigger a specific fingerpicking pattern. There are 12 such keyswitches but the Settings page allows you to change these selections from a set of around 30 different options. Triggering of chord/pattern combinations is sync’ed to your host’s tempo/bar position, so it really is very easy to play. In addition, you get expression (hardness of playing), humanise (for velocity and timing) and swing options to add further variety. You can also apply a capo to change the position on the neck that chords are voiced. A very neat ‘End With’ option allows you to end a phrase (as you release your chord) in a variety of styles to create natural endings. An auto-legato mode adds some very natural slides between suitable notes while a decent reverb is included for ambience and the simulated 12-string has variable detuning. Obviously you are limited to both the sound of the specific guitar that has been sampled (although it sounds very good and responds well to a bit of external EQ if you want to change the tonal character) and the included picking patterns. For media composers, that’s perhaps not such an issue but I could imagine singer/songwriter types loving the principle of Fingerpick and craving some additional patterns, and perhaps even some muted note options or pattern editing. That said, the price is right and, as it stands, RealiTone Fingerpick makes it super-easy to create very credible fingerpicked guitar parts. A little quirky but well worth a look.